My photographic style: Big Day Productions provide all styles of photography including Reportage, Documentary, Traditional & Creative. I have been in photography: Big Day Productions was born 4 years ago. Geographic areas I cover: We cover the whole of the UK. Testimonials: Just wanted to say a big thank you to you and Anna for our amazing wedding photos, they're absolutely stunning and we're both so happy with them. 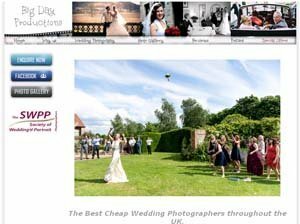 We will definitely be recommending Big Day Productions to anyone we know looking for great value, quality photography services, we can't quite believe what amazing value for money it all was. We loved the DVD boxes and presentation, it was a very special moment looking at all the photos with our family.